Compagnie Tchétché is a contemporary dance company from Abidjan, Ivory Coast founded by Béatrice Kombé in 1997 to “show that woman is not the weaker gender.” Appearing in San Francisco in 2006 with a four-woman company and the piece Dimi (Women’s Sorrow), however, the “cutting edge” dance imported from the African continent was, for the most part, tame, imitative and monotonous. Strong women performing athletic partnering and emotionally expressionistic feminism is something that has been a mainstay on Bay Area stages for more than 20 years. 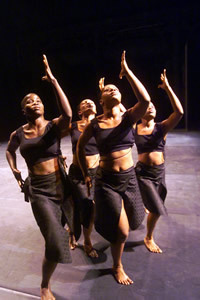 Here, the subtext of particularly African issues such as the social injustice, repressive morality and enduring patriarchal culture faced by women (all referred to in the program notes) are obscured in a theatrical presentation that features tightly accomplished unison phrases but no particular accumulation of details or progression towards catharsis. The fact of sobbing performers at the end reminds one that highly personal art always carries with it the risk of leaving out audiences. Deep feelings are not easily communicated, especially when there is a cultural divide between audience members and performers. On a purely physical basis, the dancers were fluid in presenting the modern dancey majority of movements, it was nice to see some real women with hips and thighs, and their unisons were spot-on—but it was disappointing to also be offered glimpses of traditional African dance techniques which were slipped-in but never developed. The earthy, undulating spines and familiar “steps” from the African movement vocabulary might have offered a choreographer an opportunity to create striking choreography by re-forming it, adding partnering and a woman-to-woman context. As it was, the long, non-African-looking athletic phrases that made up the lion’s share of the evening, were without much impact beyond the kinesthetic. Any emotional communication was basically lost. What remained was a dance that looked like well-performed undergraduate choreography. Too bad.